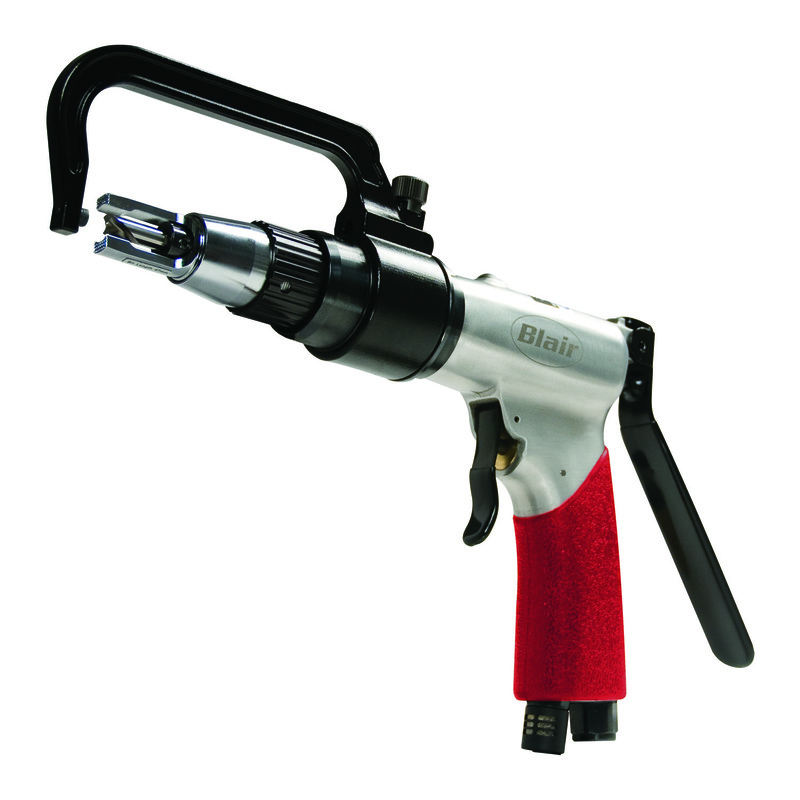 Blair Equipment Co., Inc. (Flint, MI), producers of precision sheet metal holemaking tools and spotweld cutters used in automotive body repairs, fabrication and aftermarket equipment installations introduces the Enforcer™ Spotweld Drill (Part No. 11300). The pneumatic powered spotweld drill removes spotwelds in seconds with minimal effort. The patented Enforcer Spotweld Drill can remove spotwelds in all types of automotive materials and features a lower drill bit speed of 800 rpm which is more effective on today’s ultra-high strength steels and Boron materials. The Enforced lever is manually operated to feed the spotweld cutter into and through the spotweld. This manual operation maximizes drill bit torque with no reduction in air flow and improves spotweld removal rates. The drill bit penetration is adjustable for exact depths ensuring only one panel is drilled through resulting in no damage to the underlying panel. The comfort grip handle reduces operator fatigue and ensures a solid grasp even in slippery conditions. Included with the Enforcer Spotweld Drill is: (1) 8mm Blair solid carbide triple fluted drill bit, two steady frame C-Clamps which swivel 360° (one for panel depths of 2-5/16” and one for 5-5/8”) and a custom molded storage case. Operation of the Enforcer Spotweld Drill requires 90 psi and 4 CFM. The unit is equipped with a silencer for reduced noise levels of 84 dB. The Enforcer Spotweld Drill joins Blair’s series of available tools including: fractional and metric Rotabroach® sheet metal hole cutters available individually from ¼” to 1-1/2” in diameter and also are available in kits, Blair Holcutters with sizes from 11/16 thru 3″ for materials 1/8″ thick, Spotweld Cutters for auto body repair and restoration, and the Tornado IITM portable paint shaker is used extensively in collision shops throughout North America.